Revo AXiS X3 review | What Hi-Fi? The X3 is the third iteration of Revo’s Award-winning Axis radio – and it continues the very good work of the first two versions. That means that this is a cover-all-bases table-top unit that takes in FM, DAB and internet radio, as well as being able to stream music over a local area network via DLNA. It offers wi-fi as well as Bluetooth streaming capability – now, new for the X3, with the better aptX codec. Also new for this version is an Apple Lightning dock. There’s a basic remote control handset as well. 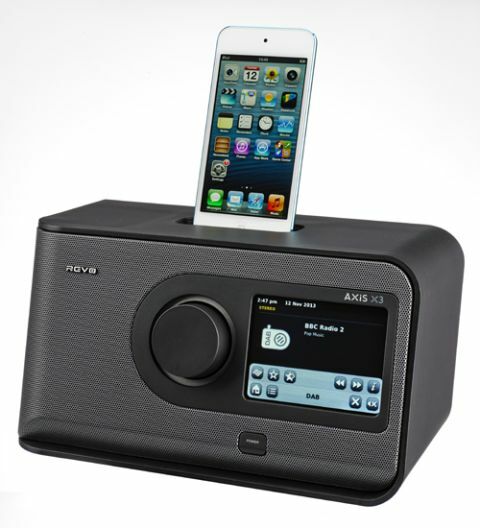 There are a few units that offer similar features, but the Axis’s USP is that touchscreen, through which it proves encouragingly simple to negotiate your way around the features – and, more importantly, around the world of internet radio. In less assured hands, that can be such an intimidating experience that even the usually forthright can easily give up before discovering the delights of WFMU or FIP. The sound the Axis provides is solid and approachable. It is particularly strong with voices and the midrange, and it is also quite happy belting out music at decent volumes and without straying into stridency or becoming uncomfortable. It’s not a terribly large box, so bass isn’t extraordinary, but it is certainly more substantial than you might expect from such a diminutive enclosure. It’s a consistent sound as well, as happy with FM and DAB as it is with internet stations or streaming over a LAN. And now that it benefits from aptX Bluetooth, this option becomes very desirable as well: the quality ramps up noticeably over the plain vanilla version. While this is undoubtedly an easy piece of kit to get your head around and as simple to use as we could wish for, not everything is completely plain sailing. The touchscreen, so innovative and impressive when we first encountered it almost half a decade ago, now suffers in comparison with the superb screens we are all so familiar with on smartphones. It’s just not as responsive and it now feels dated and slow. We found this a touch painful when we were setting the Axis X3 up. Rest assured, the process itself isn’t complicated. The first time you push an icon that requires wi-fi, the X3 will attempt to connect to your network. It found our router easily, but it was a frustrating experience trying to input the password using the onscreen keyboard, with the letter next to the one we intended to select often being confirmed instead. That’s a one-off process though, and once we were connected, that slowness in the screen is less of an issue. And it’s a relatively minor gripe over what is a nicely designed and thought-out radio. When streaming music over our network, we had no problem finding the musicm8 on our test-room server, and the X3 was quick to access and replay tracks. You don’t have to rely on radio, wi-fi and Bluetooth to get your musical fix. The Axis is now fitted with a Lightning connector, so newer iPhones and iPods will sit happily on the unit playing music while charging up. Or you can use the 3.5mm input at the back to connect pretty much any device. This is clearly an extremely adaptable and versatile unit that is ideal for listening in a busy kitchen or living room. It will serve very well in the bedroom as well, thanks to its twin alarm functions. It’s certainly got some rivals to contend with, and it might at first seem expensive at £200. That price though, when you think about it, is less than three tanks of fuel for many cars – and this is a machine that you will be wanting to keep for a long time.